Today is a special friend’s birthday. She’s Another Blonde, also known among our posse as TrailMistress Z. We are hiking pals and best buddies. Take my word for it: she’s terrific. I told her as much on the phone this morning. I’m in Colorado Springs for a few days and she is at home in northern California, so I couldn’t affirm her wonderfulness in person. My praise for her may have been a tad heavy: she offered up the idea that she could be Jesus’ Sister. Maybe it’s the altitude or the location — “Mecca” for Serious Christians, home of James Dobson’s Focus on the Family empire, with evangelical churches heavily interspersed with local strip malls — but her self-proclaimed status seemed reasonable. No need for discussion on the theological merits of her claim. It’s her birthday and we’ll just go with it. As I said, I’m in Colorado Springs, home to many believers. At this time of year, late May, the days are typically sunny and bright and clear. For some reason, strangely cold, windy and wet weather has been happening. Just yesterday, a small tornado touched down nearby, preceded by gumball-sized hail and howling winds. The skies went black with low, dense cloud cover. I checked the national weather map and it shows this part of our country with a different color than the rest of the USA. 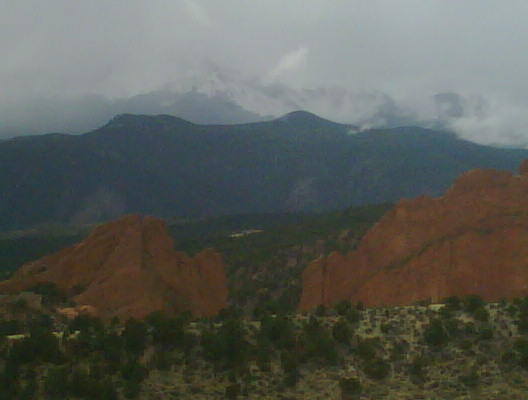 Pikes Peak dominates the region. I just took this picture so you can see how snowy and spooky it looks. What you can’t see is how fast the dark clouds are rolling around. Take this one on faith, too. Every time a sliver of sun tries to poke through, a nasty cloud hurries up to keep things ominous. It looks pretty scary. I’m not saying I believe Harold Camping. But just in case his arithmetic works this time around, don’t say I didn’t warn you. And, Nancy… go ahead and eat a really big piece of birthday cake. The calories might not matter tomorrow. One time on the way to CC from MN, my trusty honda civic ran out of gas right in front of James Dobson’s church! This was at a time in my life when I was considering religion quite a bit, and I was finding it hard not to take it as “a sign” (having grown up in a heavily catholic family). To travel 2000 miles with no problems and be stranded right here…. Fortunately though, the car actually eeked past the church and then down the hill and I rolled right into a gas station to purchase my fuel made from dead dinosuars (which were on the earth before James acknowledges this planet was even in existence! …and then drove the car a few more miles down the road to my liberal arts college. Now, here i am in CA, happily in the land of fruits and nuts.